It is going to be an extremely eventful next 72 hours for the region and the northeast as a whole. 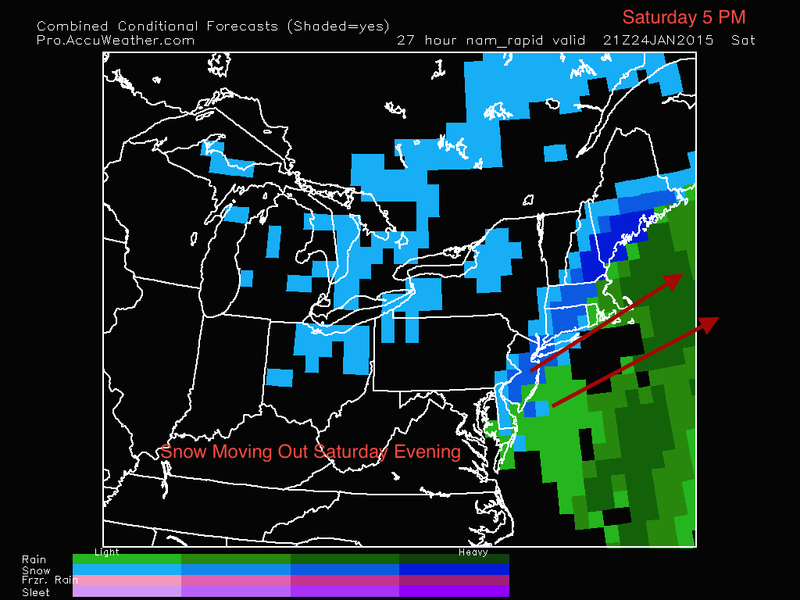 As a mentioned in my last post, a small clipper system will pass through the area late tonight and tomorrow. This storm has the stereotypical features of a clipper: plenty of cold air, fluffy snow, a general 2-4 inches for most. Precipitation will start falling late tonight and continue throughout the day tomorrow. At this point, the situation gets complicated. After the clipper exits the coast, it will interact with a weak disturbance off the Atlantic coast and strengthen rapidly into a nor’easter. Plenty of moisture will be fed into the storm from the ocean, and plenty of cold air will be present as well. The question that remains is where and when this storm will strengthen. Models have been a little inconsistent with the timing of the phase and where it will occur. 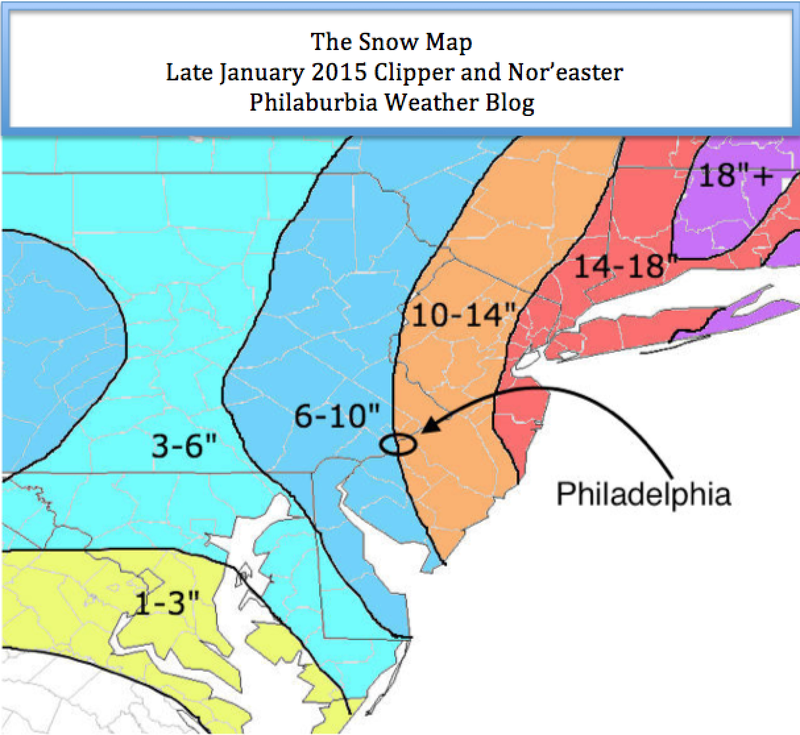 The further west the storm phases, the more snow we will receive in the Philadelphia area. In New York City and Boston, blizzard conditions will be likely. European: The European has been the aggressive model for this storm. Most of the solutions it shows bring the storm close to the coast and drop 10-15 inches of snow with totals higher in New Jersey and areas closer to New York. 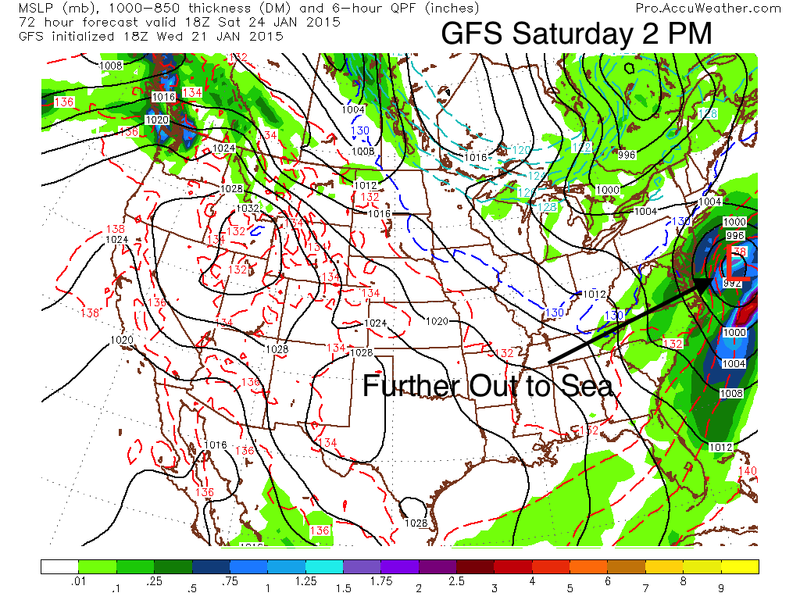 GFS: The GFS model has been the more conservative model, showing a slower phase further east than the European. It’s latest runs have been having convective feedback issues, however, which means it’s solution may not be accurate. Until these issues are resolved, I will not be favoring this model when making my forecast. 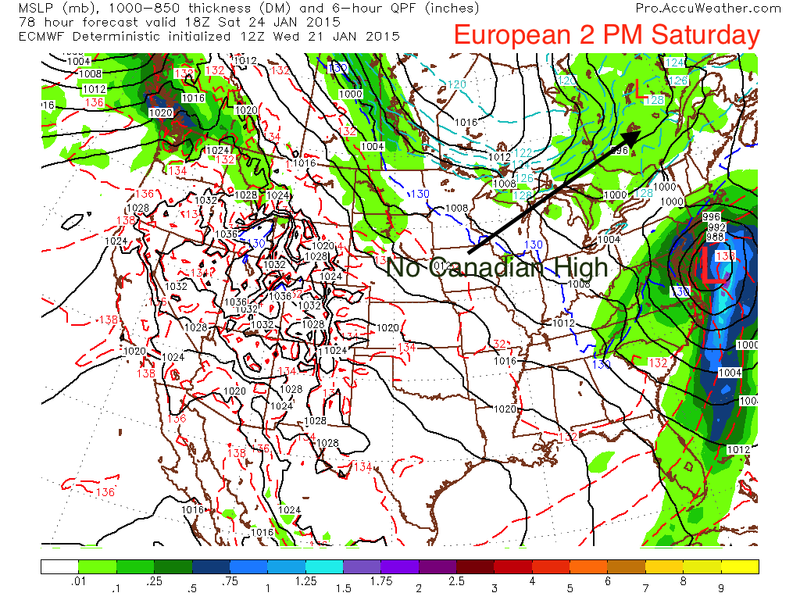 NAM: The North American Model is the middle ground between the two previous ones. It is projecting 8-12 inches falling by Wednesday morning. I am favoring this model the most out of the three because of its increased accuracy in the short run. While the clipper forecast is fairly straight forward, the following nor’easter involves many dynamic components which need to be ideal for a major snowstorm to occur in the Delaware Valley. Even though these conditions are favorable, there is still some uncertainty in the exact amount of snow we will receive by Wednesday morning. Temperatures will be in mid-20s, which means a light fluffy snow will fall. These low temperatures also increase the snow to precipitation ratio, which means snow will accumulate faster than normal. The snow map below shows totals from the clipper and the nor’easter combined. Depending on the formation of the low off the coast, the 10-14″ area is subject to shift in the next day or two. Overall, 6-10″ inches is good bet for the city and areas south and west. Totals will be higher closer to NYC and even higher near Boston, where blizzard conditions will likely occur. Messy Saturday Coming. Snowy Monday as Well? Hey everyone. Quick post here. We are looking at a very messy and slushy overnight and Saturday as a large storm system will ride the coast in the next 12-24 hours. While I was wrong with my initial thoughts of a plowable snow event, I was correct when I said there is just not enough cold air aloft to produce snow. The precipitation will start in the next few hours and continue throughout the day tomorrow. Snow totals will likely be around 2-4 inches north of Philadelphia and 1-2 inches to the south. Precipitation will initially start as snow then switch over to rain sometime tomorrow morning before changing back to snow by tomorrow afternoon. The storm should be over by tomorrow night. 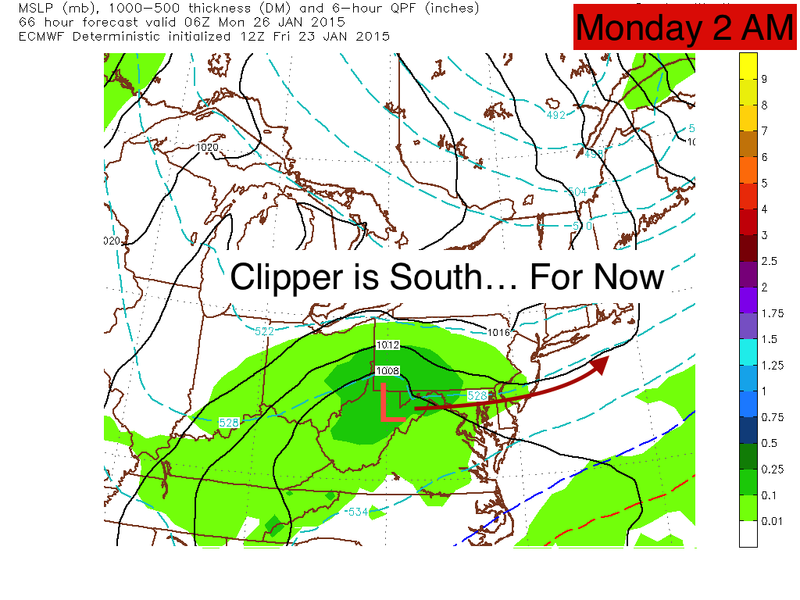 I am also tracking a clipper system which will ride through the area on Monday. Many of the models are keeping the storm suppressed to the south at this point, which would mean lower totals for the region. Regardless of the amount of snow, travel conditions on Monday will not be ideal. I would not rule out school cancellations and numerous travel delays. I will go more into detail for this storm in the coming day or two. Other than that, drive slow tomorrow and enjoy the slushy mess! Hey everyone. It has been quite a while since my last post. Winter 2014-2015 has been fairly quiet and cold so far. According to reports, we have only received 1-2 inches of snow so far this winter. This is much lower than what we had at this time last year. Temperatures this winter have been around average so far. December finished 4 degrees above normal, while January has been nearly 3 degrees below normal. This contradicts my original forecast, where I said January would be warmer than December. An explanation for this flip in temperatures lies in the El Niño strength over the past couple months. The Niño we’re currently experiencing decreased from December into January, this indicates why our temperatures have been colder in January compared. In current news, I am currently tracking a winter storm during the day on Saturday. Analytical indicators have been favoring a large storm streaming up from the Gulf of Mexico and intensifying off of the Mid-Atlantic coast. While the setup for this storm is not perfect, I do believe a plowable amount of snow will fall north and west of Philadelphia. 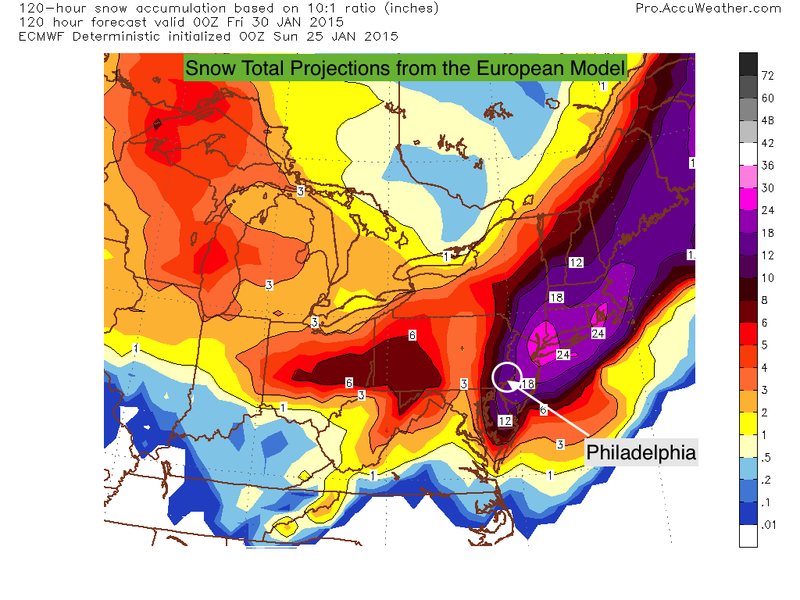 Current models have been showing less than ideal conditions for a major east coast snowstorm. The most major flaw in the pattern right now is the lack of a “Quebec high”, which tends to bring frigid Canadian air down and feed the cold side of the storm. There is also no indication of strong blocking ahead of the storm, which means that there is a chance that it could quickly run east of the benchmark. This ultimately means that we could have some mixing with this storm as well as a sharp cutoff in the amount of precipitation north and west of the city. 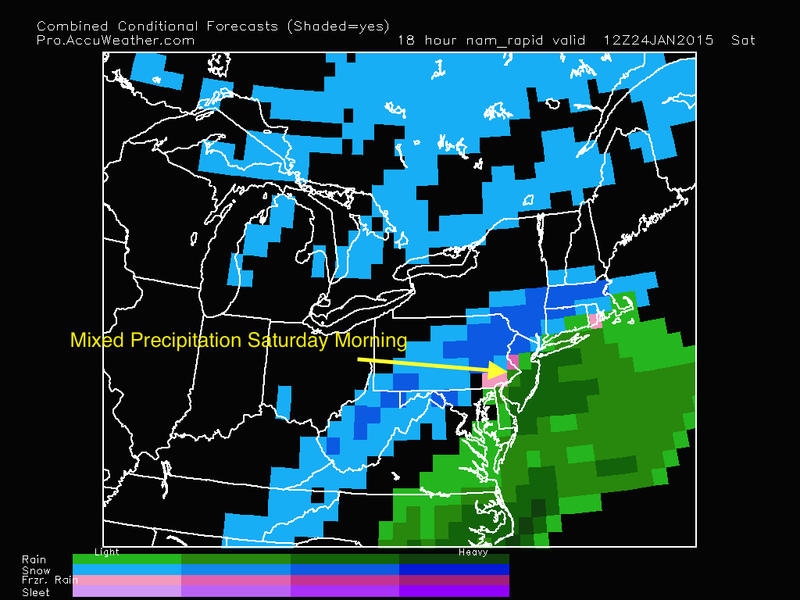 The European and North American Model (NAM) have been aggressive with the amount of moisture associated with the storm. They also forecast the storm further west than some of the other models. With both models, however, mixing will be an issue south and east of the city. While snow totals could be around 6-8 inches for Philadelphia north, in South Jersey snow totals may be limited to 2-3 inches at the most. This mixing issue, as I alluded to earlier, is from the lack of the Canadian high providing cold air for the strengthening storm. The GFS model has been possibly underestimating the strength of the storm. As a result, it brings the track further out to sea, which diminishes snow totals throughout the region. A general 2-4 inches would be expected if the GFS solution was the correct one. At this point, I am leaning toward the Euro and NAM solutions. The reason for this lies in the Arctic Oscillation teleconnection, which is one of the main indicators I use to determine the strength of a storm. As you can see from the graph below, the AO is projected to sharply become positive a day after our storm pulls through. Any time this happens, it tends to indicate a change in the upper atmosphere in the arctic circle, possibly caused by a major storm system. This metric has increased my confidence for a larger and stronger storm on Saturday. I will have more updates as we get closer to Saturday. I will release my snow map Friday night.